The Ghostrike Series Fixed Blade is an ultra-light self defense belt knife with a sheath system configurable for low profile or open carry. The modular sheath system can be worn horizontally on the belt beneath an un-tucked shirt or vertically on a belt like a traditional fixed blade knife. Simply detach the belt loops from the grommet holes and arrange them as you please. Made with 420HC steel, the Ghostrike Series Fixed Blade&apos;s black ceramic coating offers superior corrosion resistance and minimizes reflective surfaces. 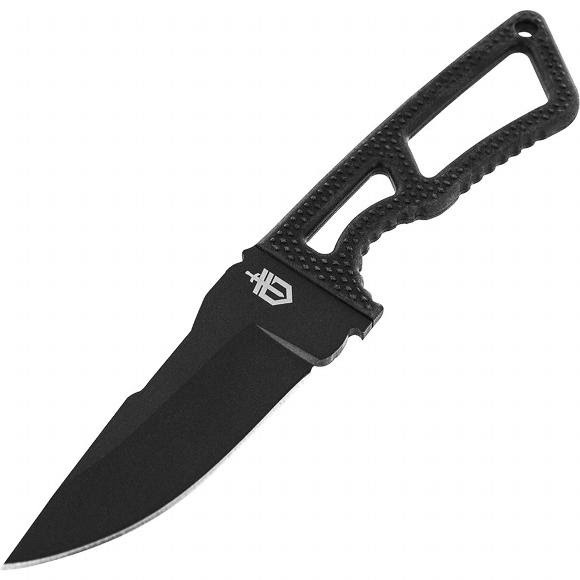 Its 3.3 inch fine edge drop point blade serves to slice and rip with precision. The compact skeletal fixed blade is sized for a subtle presence, and can be worn horizontally or vertically without making a profile against your outer clothing. The rubber over-mold handle features a diamond texture, allowing for a superior grip in critical situations. Know your local laws before you decide how to carry. The Ghostrike Series Fixed Blade knife is proudly made in Portland, OR.